Lately, most of the Dream Dinners meals that Mike or I have cooked have been things we’ve tried in the past. However, in October, we had a chance to try a new delicious side. I must have missed these last year because I definitely would have tried these Parmesan Roasted Green Beans. After thawing these, I preheated the oven to 400, prepared a dish and added the green beans. I topped the green beans with cheeses and baked for about 20 minutes until it was golden and delicious. These green beans were delightful! I loved the combination of my favorite vegetable and a cheesy blend. I will be sure to buy a few of these next time I see them in the Sides and Sweets freezer. Way back in October, Mike and I spent an afternoon at the Domain. We saw a movie, ran some errands and decided to try a new (to us) restaurant while we were there. It’s hard to say “no” to Tex Mex food, so we gave Cyclone Anaya’s a try. It was a pretty fun vibe with a little bit of a wait on a Sunday afternoon. We ordered food and enjoyed some people watching. Our biggest complaint about the restaurant was the volume! They were playing some great music, had several TVs with various sporting events going, but it was so loud. Mike and I could barely hear each other and many of the tables seemed to be shouting to hear each other. When our food arrived, we quickly realized the error in our ways. The portions were huge! After popcorn at the movie, we definitely did not need this much food! My tacos al carbon were delicious and had I not been walking all over the Domain, I would have gladly taken some leftovers for dinner. Mike enjoyed his tamales, which happened to be smothered in cheese. Overall, we felt that the food was great, but the atmosphere was a little much for our laid back vibe. We would likely go back, but not with friends or family if we wanted to have a conversation. Back to September in my blogging, as I have gotten very behind. 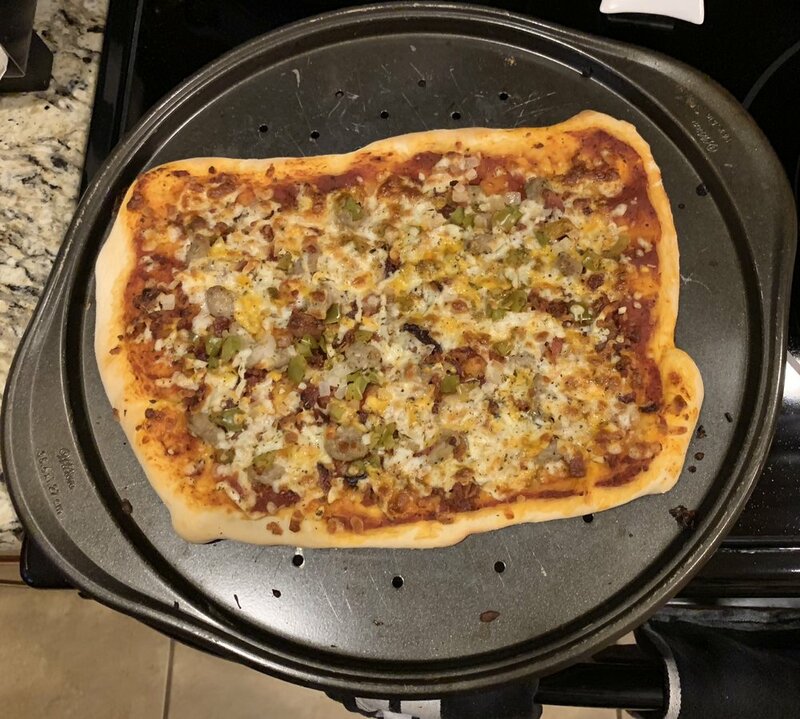 One of the new Dream Dinners meals we tried was Family Pizza Night. The ingredients made two decent sized pizzas, so we had plenty of leftovers. With this meal, we were given pizza dough to make our our pizzas. I personally hate making pizzas and working with dough so after struggling a little bit, I handed the pizza assembly over to Mike. Our pizza included sausage, bacon, onions, peppers, cheese and delicious sauce. After cooking, we put together a salad and enjoyed. The pizza was yummy and it was a great dinner. We would probably try this meal again, but next time, I will know to leave the pizza making to the expert! Austin is full of great Tex Mex and BBQ and its our goal to try as many of each as possible. About a month ago, we got to try a different taco place. Velvet Taco is located at the Domain in the Rock Rose. Mike had tried it once before for a work lunch and it was my turn to give it a try. There were several unique taco combinations, chicken options, and red velvet cake. I knew that I would probably get another snack at some point, so I opted for the Buffalo Chicken Taco. Mike ordered the Buffalo Chicken Taco and the Chicken Tikka Masala Taco. Both tacos were delicious and very accurate in their flavor profile. There were several categories of tacos, each with several choices, including: chicken vegetarian, pork, beef, and fish. I look forward to returning again and trying other tacos...and some red velvet cake! Mike was busy in September, cooking delicious Dream Dinners meals while I was busy hosting events. One of our favorite new meals was the Crem Tortellini with Bacon. This pasta dish was different than most of the Dream Dinners pasta dishes that are baked in the oven. First, Mike boiled a pot of water, cooked the tortellini, drained it and set aside. In a saucepan, he heated up the sauce, simmering it and then adding the bacon/pea mixture and simmering. Next, he added the sauce to the pasta and dinner was ready. We served this with a salad and it was ready in about 20-25 minutes. This pasta was unique and I loved the addition of bacon and peas. Dream Dinners made our lives easier once again! Tomorrow I head into Dream Dinners to assemble my October meals, so it seems like a good time to get to work on finishing my blogs for August meals. Hosting lots of events in September and October, haven’t left me with much time to cook dinner. Thankfully, Mike enjoys making Dream Dinners meals and I get to have a great home cooked meal when I get home. One of our favorite new meals was the Buffalo Chicken Cavatappi. We love anything buffalo flavored, so we had high hopes for this dish. Mike started by cooking the pasta. In a skillet, he brought the cream cheese buffal sauce to a boil, whisking it until it was well blended. He added the chicken, cooking it until it was warmed through. Finally, he added the sauce to the cooked pasta, tossing it to coat. Mike did a great job garnishing the pasta with green onions and green, too. This meal was delicious. The buffalo sauce had a great flavor and a great creamy texture. This leftover didn’t sit in our fridge long! We should have made 2 of these because we don’t know when it will be on the menu again. I can’t wait to have it again! In September, we tried a new food truck one week at Whitestone. I know its been a while, as Whitestone now has a permanent food truck, but this one was pretty good, too. We tried the Dog Pound, which had hotdogs and sides. We tried 2 different hot dogs and tots that had mini hotdogs inside. Everything was delicious! There were lots of unique ingredients that made for some really unique hotdogs. We would definitely try this food truck again if we see it out and about. September flew by like a blur! I was sick for a few weeks, had a huge event followed by several smaller events, and a birthday to keep me busy. While I am way behind on blogging, I am thrilled to share some new finds and meal that I’ve tried lately. A new place that we visited over Labor Day weekend was Lucy’s Fried Chicken. Lucy’s is an Austin “famous” location that we hadn’t made it to, as it was not super close to us. A new location opened in Cedar Park pretty close to Whitestone Brewery. I will admit that I really don’t like fried foods very much, but I am a fan of chicken. We both tried the chicken tenders and split a side of macaroni and cheese. The chicken tenders were delicious and the basket was a very generous portion. We probably could have split them (especially because I was pretty sick when we ate here). The macaroni and cheese was pretty disappointing. It was low on the cheese factor. We knew we would definitely head back and we did this past weekend. This time I tried the chicken nachos and Mike got a Devil’s Cove Chicken Sandwich. We were both pleased with our choices. The nachos were a huge portion and I definitely loved the garnish of a chicken wing on top. Mike’s sandwich was not fried chicken and the chicken was actually served cold-a sandwich that I would definitely enjoy. We really like the food at Lucy’s and the cute environment. This will definitely be a place that we share with friends and family who come to visit. September has been super busy and its time to catch up on blogs! We have done a great job eating all our meals this month and I know its time for my next session because our freezer is almost totally empty! Mike has made several meals this month and especially last week when I had 10 events in 5 days! I was so lucky to have Dream Dinners to ensure that we had quick, tasty, and healthy meals on our table each night. A few weeks ago, I made Bistro Flank Steak with Southwest Ranch Pasta Salad. I started by massaging the steak to ensure that it was evenly coated with the herb rub and let it rest at room temperature for about 30 minutes before cooking it. While the steak was resting, I got to work on the pasta salad. I brought a pot of wat to a boil and boiled my pasta for about 7 minutes. I drained and rinsed the pasta with cold water, keeping it in the fridge until it was dinner time. I grilled the steak on the stovetop in my cast iron grill pan for about 9 minutes on each side. We let the steak rest for about 5 minutes before slicing thinly. Right before dinner, I added the vegetable mix and ranch dressing to the salad, combining well. We sprinkled the pasta salad with shredded cheese, added some flank steak and dinner was ready. We loved the flank steak. It had a great flavor and was delicious as steak taco leftovers. The pasta salad was okay. I typically prefer a pasta salad with an Italian dressing and this was a little too creamy for my taste. We will definitely order the flank steak again and probably skip the pasta salad in the future because while it was good, it wasn’t quite to our preferences. Another recent Dream Dinners success was Steak Caprese. I made a pasta salad and cut up some strawberries so all I needed was a delicious protein to round out my plate. I started by draining the liquid from some fire roasted tomatoes and set them aside. I removed the steaks from the marinade and grilled them on high for about 5 minutes. After flipping the steaks, I group them together and placed 1 tbsp pesto and 1tbsp fire roasted tomatoes on top and cook another 5 minutes. Next, I topped each steak with mozzerella cheese and let it melt. We let the steaks rest about 5 minutes before serving. These steaks were tasty and different. I would definitely be happy to eat these again. The past few weeks have been a blur with lots of work and getting sick. Thankfully, I had a freezer full of Dream Dinners meals to make my life a little bit easier. One of the meals, I tried was Honey Chipotle Pork Tenderloint, which we paired with the Chipotle Maple Corn. This was the first time we had tried either of these items. The pork tenderloin was delicious-it might be my favorite Dream Dinners pork tenderloin. I really love the marinade on this one. I heated up the oven and lined a baking sheet with foil. I put the pork tenderloin on the pan and spread half the glaze on it. I baked the tenderloin for 25 minutes and covered it with the remaining glaze, baking it another 10 minutes. After the tenderloin was finished cooking, I let it rest for 5-10 minutes before Mike sliced it. While the pork was resting, I made the corn. I heated up a skillet, added the butter blend and corn and sautéed for about 5 minutes. The corn and pork were ready to cook about the same time. Both had a great flavor and were super easy to make. Another dinner time made a little bit easier thanks to Dream Dinners. Last week was another busy week and Dream Dinners kept us fed again! Most of the meals I made last week were repeats of ones we’d tried and loved before, but I did finally get to try the Buffalo Ranch Chicken. It was a simple dish that we paired with some tots. I heated up my grill pan and removed the chicken from the marinade. I grilled the chicken for about 5-6 minutes on each side. Next, I added the glaze and sprinkled with Gorgonzola cheese, grilling the chicken for another minute. Once the cheese melted, it was ready to serve. The chicken was tasty, but I thought it would have been better with a little bit more buffalo flavor. I think in the future, I need to make sure to add plenty of buffalo sauce. I also might switch to a different type of cheese. All in all, this meal was pretty tasty and with a few modifications to our taste would be delicious. Another perk to Dream DInners is the ability to be able to change meals to your taste and I plan to take adavantage of that option next time I make this meal. On Thursday, I made Herb Crusted Flank Steak. I was excited because I have really liked the Dream Dinners steaks so far, and I was told that this was one of the best one. I made a side of the Savory Roasted Cauliflower to go with the steak. For the steak, I started by removing it from the marinade and applying the herb rub to all sides. I let it rest at room temperature for about 30 minutes before I started cooking it. I heated up my grill pan and cooked the steak for about 8 minutes on each side. After it was done cooking, I let the steak rest about 5 minutes and Mike sliced it to eat. This was a delicious meal and I was glad that this steak only comes in the larger size, so we would be sure to have leftovers. The herb rub and marinade gave the steak a delicious flavor. We also enjoyed the steak tonight as tacos and there is still a little bit left that may get turned into nachos. I look forward to the next time this steak is on the menu. Tuesday was another busy day in our house. I picked Mike up from work, but I had an event that evening. We ended up working as a team to get dinner made before I left. I sliced and sugared some strawberries and finished getting ready while Mike prepared our Dream Dinner meal. He started by boiling water for pasta. Next, he heated up the oven to 400 and prepared the pan. He made 3 piles of bread crumbs on the sheet and pressed chicken into the breading, coating both sides. He baked the chicken for about 15 minutes. While the chicken was baking, he simmered the sauce in a sauté pan, added the cooked pasta to combine. We served the pasta, chicken and strawberries and dinner was ready. We really loved this dish! The chicken was cooked to perfection and the pasta had a light, summery taste. The strawberries were the perfect addition to complete our plate. There was even plenty of pasta leftover for a few lunches. I will definitely make sure to order multiples of this meal in the future. Another busy week in our house makes us super thankful that we had a freezer full of Dream Dinners! Recently, we made the Moroccan Meatballs on Jasmine Rice. I had actually tried these in the store as an appetizer, so I knew that they were tasty, but now I had the chance to make them myself. I started by preheating the oven and preparing my pan. I combined the ground beef and seasoning mixture. Next, with the help of my portion scoop, I formed golf ball sized meatballs. The idea was to skewer the meatballs and put them in the pan. My meatballs didn’t want to skewer without falling apart, so I just placed them in the pan. I covered them with tomato sauce and baked them for 20 minutes. I removed them and turned them over, basting them with sauce. I baked them another 20 minutes until they were browned. While the meatballs were on their second round of cooking, I made the jasmine rice. We served the meatballs on the rice with extra sauce, as desired. I really liked the flavor of these meatballs. I wish I could remember what seasoning I used, but they were still great. We each had several meatballs and rice, with plenty of leftovers, too. Once again, Dream Dinners made it possible for us to get dinner on the table without having to spend too much time prepping and worrying. After a long weekend, I was ready to get back into a normal routine of Dream Dinners last night. I had thawed a meal and ended up making some Chicken Avignon and Asparagus, which I paired with some rice. This dish was quite tasty and I loved that it sounded much fancier than the amount of work it took. I started by working on the the rice and heating up the oven for the asparagus. Next, I got to work on the chicken. I placed the chicken in the bag with the flour and tossed it to coat. I heated up some oil over medium heat in a skillet. Then, I browned the chicken breasts for about 6 minutes on each side. After the chicken was cooked, I removed it from the pan and let it set covered on a plate to stay warm. I added the white wine sauce to the pan, whisking it for about 2-3 minutes. Finally, I added in the half and half, whisking and simmering for about 7 minutes until it was thick. I drizzled the sauce over the chicken and served it with the asparagus and rice. This dish has amazing flavor and seemed pretty fancy, but was pretty quick and easy to make. We enjoyed this meal and it was definitely not something I would have come up with on my own. Thanks again to Dream Dinners for helping to expand my palate. This week we got to make another new Dream Dinners meal. It’s been a busy week and this definitely made my life a little bit easier. I love any of our pulled pork dishes, so I was excited to give this meal a try. I started by preheating my oven for the salt and pepper fries. Once those had been cooking for a bit, I got stared on the rest of the meal. I formed the beef into 3 patties and pan fried them about 6-8 minutes on each side. While the burgers were cooking, I heated the pulled port in a sauce pan on the stovetop. I decided not to toast the buns because I have not had good luck with this lately and have burned too many buns. When the burgers and pork was done cooking, I assembled the burgers with a bun, burger, pork, and a slice of cheese. We served with the salt and pepper fries and dinner was ready. This was a pretty tasty meal. I love all my Dream Dinners burgers and this was a different twist on a basic burger. The burgers had great flavor with the addition of the pork and it was something I would not have thought to try. 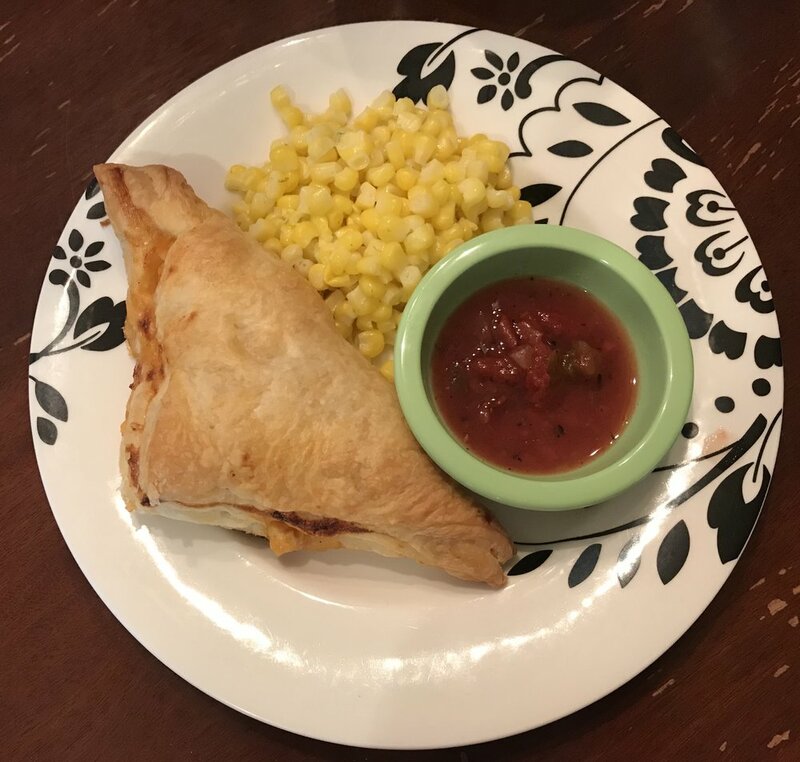 Thanks to Dream Dinners, we had another quick meal on the table and were able to enjoy the rest of our evening!